As you can see from the picture I have already made my decision, but I would still appreciate your thoughts. I found this jacket in a local antique/secondhand shop just before Christmas. Speaking to the owner I discovered it is made of red squirrel skins. This isn't as horrendous as it sounds as it dates from the 1930s - 40s when the Canadian red squirrel population was a serious problem and the animals were being culled. 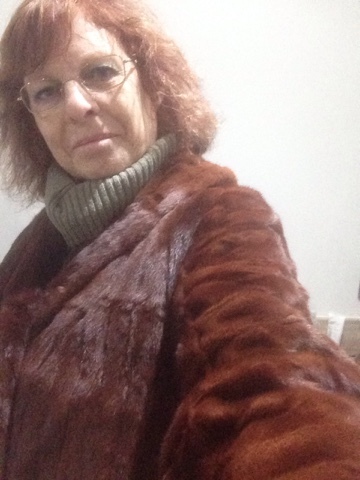 Rather than waste the gorgeous fur it was shipped to UK and Europe and made into clothing by skilled furriers. This practice apparently ended during the Suez Crisis when shipping the skins became uneconomical. I absolutely fell in love with the coat, the colour and sheen are wonderful. It is recycling. It is warm. It makes me feel good. But, I do appreciate the anti-fur lobby may not be friendly about it, which is why I would like your opinion, dear reader. Pirate bunting. Happy Christmas Sam. 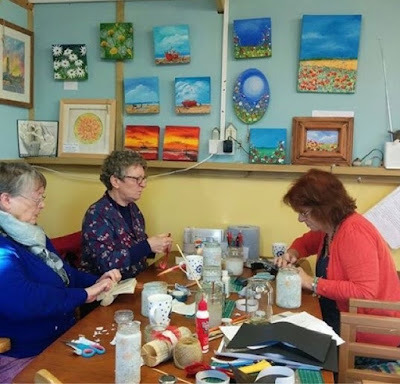 What a smashing day Country Roads Quilters had with Debbie Mitchell yesterday when we created various Christmas craft items as well as enjoying beautiful, home-cooked food and great companionship. It couldn't be called a workshop, more a funshop. 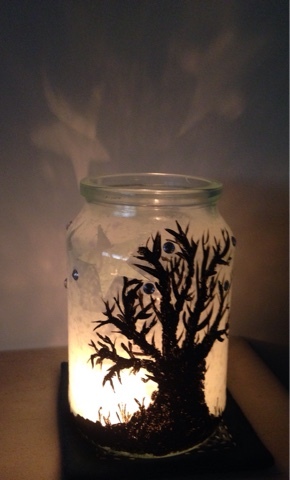 My favourite item of all we made was this frosted candle holder with stencilled stars and a tree silhouette painted in acrylic paint. I was concentrating so hard on book folding that I didn't even notice that Debbie took a picture of Trish, Fenella and me (and our rather messy table). Those are some of Debbie's paintings on the wall. 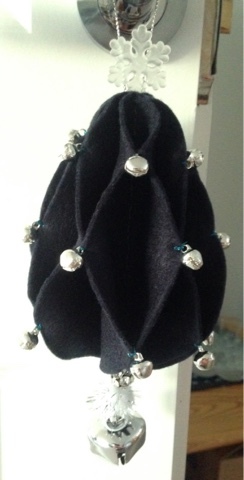 Using felt we made three dimensional tree, bell or bauble-shaped decorations. 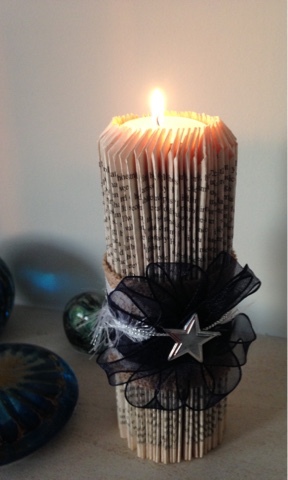 All that concentration and book folding resulted in this candle ornament. I have a tea light in it for the photograph but that will be replaced with a battery-operated light for Christmas, I don't want all that work to go up in smoke! 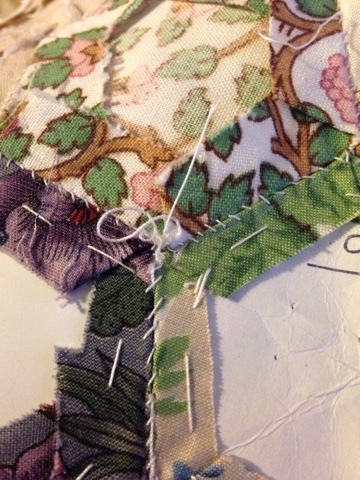 This morning was still a little murky so I hit the sewing straight after breakfast. The quilt in the foreground was already finished and this morning I finished the other two with the exception of hand stitching the binding on the reverse and adding the labels. These are all for Project Linus. They will be collected at Country Roads Quilters in January along with the many, many others members have been generous enough to make. While I was having lunch there was a knock at the door and a guy standing there with a big box, exciting eh? It was the roses I ordered from Peter Beales in September. Fortunately, the day has brightened up considerably and it is perfect planting weather. All that digging has left me ready for a nice cup of tea and a slice of courgette and lime cake! Tomorrow, assuming it continues to be dry and bright, I shall plant tulip bulbs around the roses and then sit back and wait for Spring. Although the recent weather has not been as bad here as in other areas of the country it has still been staying in and sewing weather. 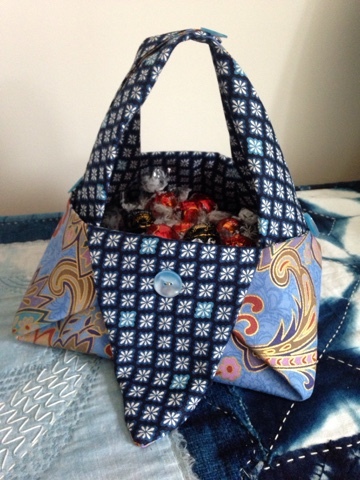 I caught up with some of my purchases from Festival of Quilts, firstly making this gorgeous Yuki bag from Japan Crafts. You might notice it contains a few chocolates, ready for Christmas! I then worked with the Donegal tweed fabric I bought from Fabric Affair. My original plan had been to make a double sided throw but instead I decided to simply bind the length of tweed and use the squares for a different project. It's so soft and warm so if the weather gets worse I know where I'll be! 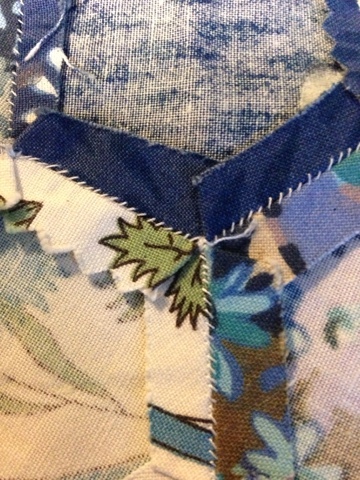 Next, some secret piecing and stitching, I'll share more of this in January. And finally, I started another Project Linus quilt. It's currently a pile of pieces waiting to be pressed and joined, hopefully I'll share a picture in a few days. 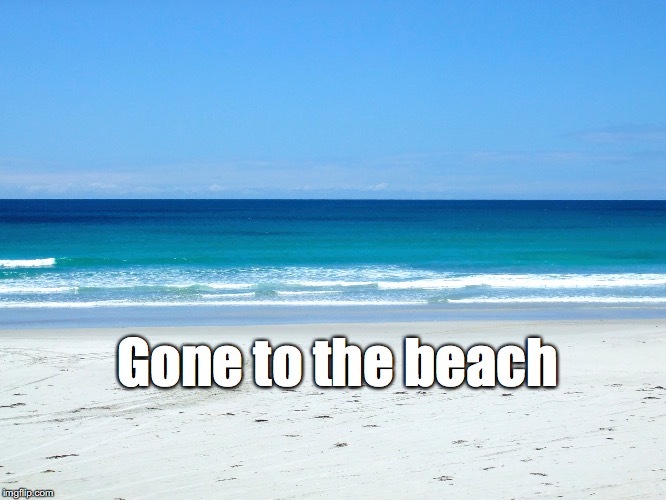 Here's hoping the weather is not too bad where you are and that you have avoided storms, flooding, snow, earthquakes, tsunamis, wild winds and torrential rain and managed to keep safe, warm and dry. I have now removed all the "papers" from Mummy's quilt, except those on the very edge. I have been struck with how much Mummy's stitches have varied. I know my own stitching varies, the stitches usually getting larger as the day goes on. Mummy could be described as a perfectionist in many things, and was a beautiful watercolourist, yet her stitches could be quite erratic. 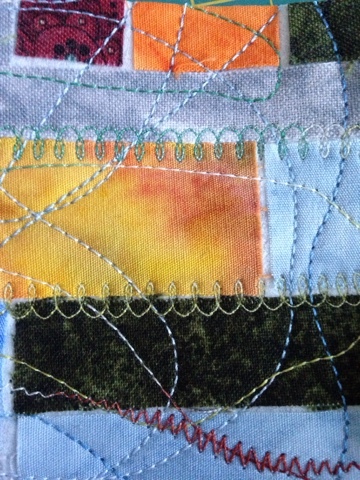 A friend at Country Roads Quilts this week summed it up by saying she was "just getting the material sewn together". The quilt is typical of the origins of quilting, made up of what was available and stitched together to provide covering and warmth, quickly. 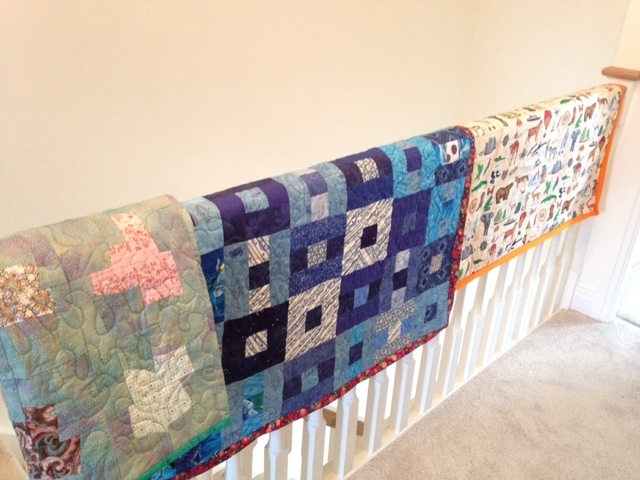 I remember Mummy saying she didn't intend the quilt to cost her a penny. Some hexagons are tacked with up to three pieces of cotton so I think she must have been recycling thread as well as fabric. I can imagine some of the stitches done at leisure, some in poor light, some maybe in anger for some reason. My sestra wondered whether we should remove the papers in order in case there was a message in them. No message, as such, but those stitches seem full of life and meaning. 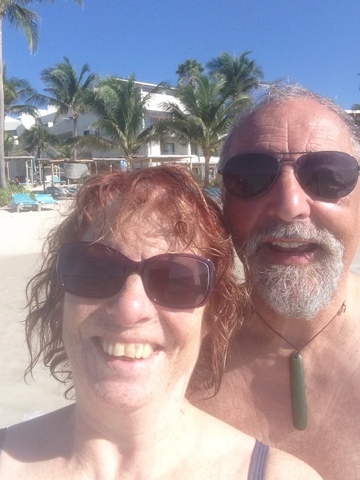 We had a wonderful holiday in Mexico to celebrate 25 years of unwedded bliss, Al and I would both go as far as to say it was a perfect holiday. We completely relaxed, enjoyed good food and the glorious setting of our hotel on the Caribbean Sea. 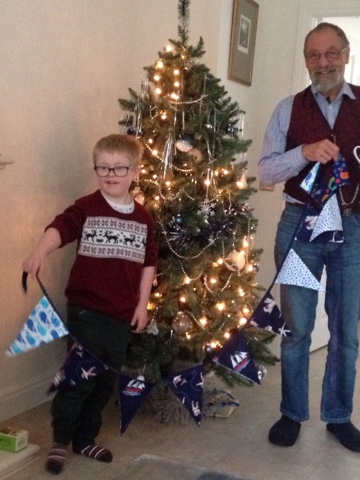 Now we are home and it is definitely Winter and I have been sewing enthusiastically. 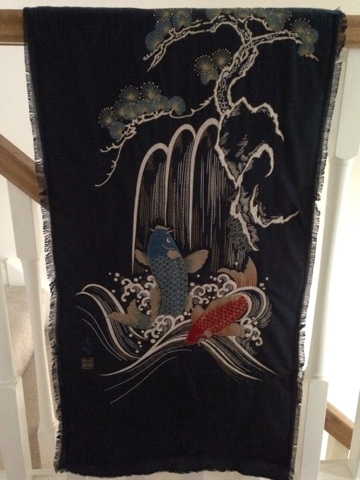 I have finished the koi wall hanging that I've been working on for a while. 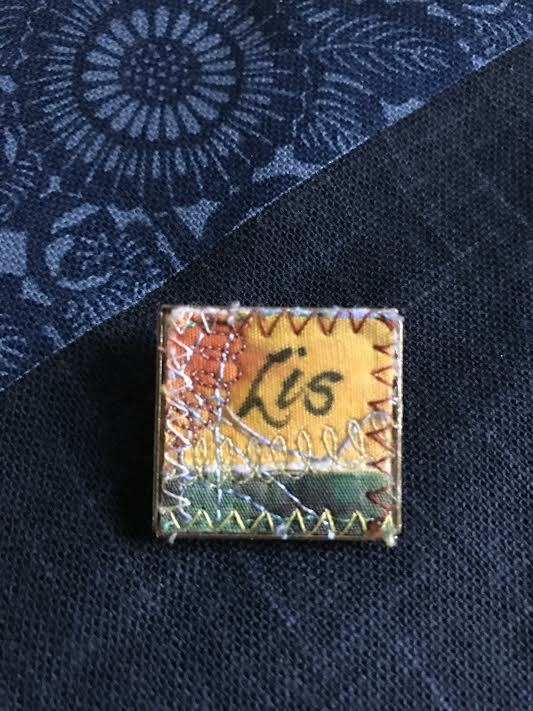 My sister came for a visit and she has recently started patchwork. Her first major project is a wedding sampler quilt for her daughter. The wedding is in August 2017 so Jane's going to be busy. While she was here we had a good look at Mummy's quilt. You might remember this is an English paper-pieced "Grandmother's Flower Garden" quilt. Mummy was determined that it was to be all recycled fabrics, in the traditional way. I had thought I might do something dramatic with it but when we laid it out on the guest bed it looked just right so I am simply going to finish it. 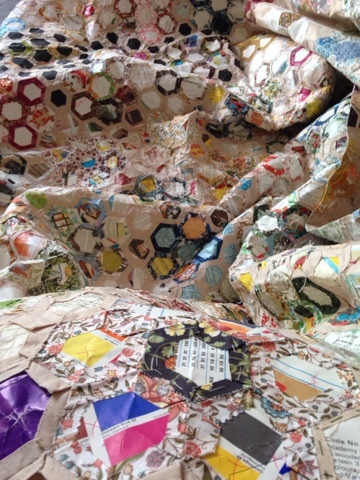 My first job is to remove a lot of the papers to reduce the weight and make the quilt easier to work with. I say "papers" but they are actually more of "cards" being cut from Christmas and birthday cards and art and education supplies catalogues. 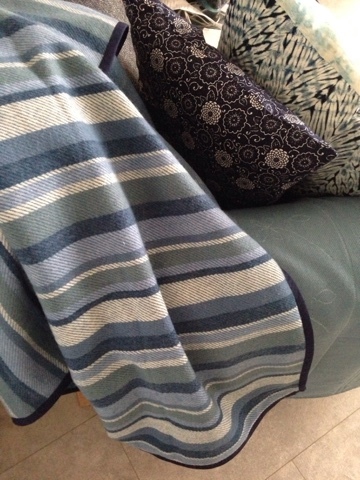 The fabrics are a real mixture, a lot of furnishing weight and the plain is all curtain lining. 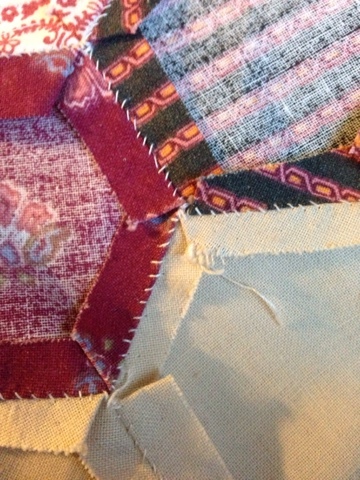 Fortunately I also inherited a box full of extra hexagons and fabric. Alan and I have been sitting in companionable silence, with our thoughts, unpicking Mummy's tacking stitches. Some news resulting from my sister's recent visit is that she has decided to join me when I visit Japan next year. Golly, it's been a few years since we've shared a bedroom!! We're both really excited about it, or rather, Jane was excited, until I explained about onsen etiquette!! Still, she'll rock the karaoke experience while I'm hiding in the corner. And, speaking of holidays, here's a quick reminder that only a few weeks ago we were enjoying temperatures of 30+° C rather than today's 2°C. Decision made. I am making a return visit to Japan! I had a long chat with Jill Clay of Festival of Japan when I was at Festival of Quilts in August, and since then I have studied the website, asked a lot of questions, considered my finances and tried to persuade dearly beloved that he would enjoy a textile-based trip to Japan! Al decided against the trip, I think he would rather make another visit to New Zealand, but I really want to go, and Jill's itinerary sounds fantastic, plus she only has small groups, so I've reserved my place on the Autumn Maples and Textiles visit in 2017. I'll have thirteen nights based in Kyoto with a host of activities and visits that I'm sure I don't have the connections or the language skills to arrange for myself. It's a long way off and I don't have exact dates yet but when I do I will decide whether to extend my trip and visit friends in Tokyo. I've also sent the details to my sister, now she is no longer teaching she has time to travel and I think she might be up for the trip. Golly, could we share a bedroom again, it's been about 50 years!!? Before then, however, Al and I have had 25 years together and it's time to celebrate. 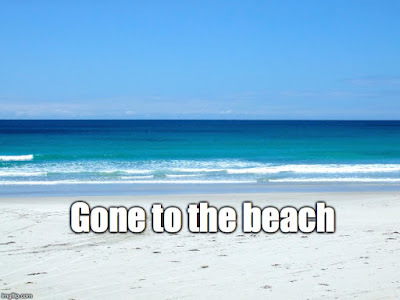 We're soon taking off for a lazy holiday in Akumal Bay, Mexico. Today I have begun work on a printed panel I bought in Japan in 2009. 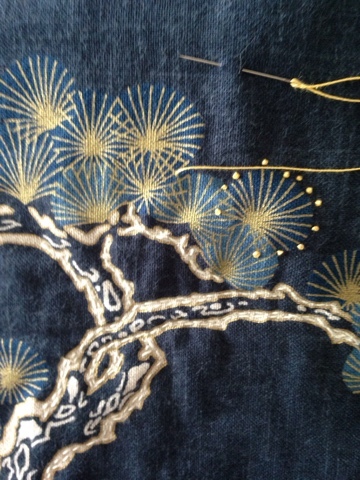 Just gentle hand stitching, very relaxing. I am in the process of deciding to make another trip to Japan, hopefully next year, so the contemplative sewing is perfect. Hoping the weekend has been good for you all. It's back to school for children (and teachers) this week.